@Kure24 wrote: Is there a surprise f1 or did something unexpected happen. people are guessing that either Hannah or tayshia could be surprise F1 because of RS’s tweet. Just a guess bc RS had Cassie as the frontrunner. Also surprise bc of what was said about her situation before going on the show. I have no idea what RS's tweeted, or what speculation is going on elsewhere, I'm just going by the old fashion sleuthing. The F3 by now is usually antsy and SM is the first thing they seem to organize change and play with when they get back. She hasn't done so yet. They seemed to enjoy themselves in the vid's we saw of their date when they were originally posted. @sanlee088 nice to see you! @flojo031 Thanks. I wasn't sure if we knew anything French related that she was involved with before going on the show. Still watching her account as well as Hannah G's and I'm now fascinated by the fact that they're both laying low for so long, while the F1 is back on SM accepting follow requests and following others. I have a feeling that RS's tweet last Friday has something to do with these two women. I've been looking at the stills from the last trailer that RS posted on Twitter, and trying to figure out where that shot with Tayshia and Colton was taken based on that straw umbrella in the background. I've already put together the two shots of him in a beachy type setting, jumping into the water wearing pink shorts with 2 different blonde women, must have been on the Asian leg of the season (episodes:4-6). I recognized Heather based on her super long hair and the bathing suit she was wearing, which matched the style of what she was wearing in that brief clip of her on the beach making that weird sound in the trailer we saw. Since Heather made it to F7, those shots couldn't have been on the Portugal/Spain final leg of the season. Anyway, those straw umbrellas are popular in different countries including Spain, but there are some variations on the style. I can't seem to find a way to identify where that part of the trailer was filmed, but if it's in Spain, then Tayshia may have reached F2, but I'm getting the feeling that Hannah G. probably snagged that spot. At any rate, if Tayshia was F3, that would mean she was eliminated back on Nov. 11th?, that's 14 days ago and I'm getting even more curious about why she hasn't appeared on SM yet. My imagination is running wild with each passing day. islandchild2 wrote: Still watching her account as well as Hannah G's and I'm now fascinated by the fact that they're both laying low for so long, while the F1 is back on SM accepting follow requests and following others. I have a feeling that RS's tweet last Friday has something to do with these two women. I've been looking at the stills from the last trailer that RS posted on Twitter, and trying to figure out where that shot with Tayshia and Colton was taken based on that straw umbrella in the background. I've already put together the two shots of him in a beachy type setting, jumping into the water wearing pink shorts with 2 different blonde women, must have been on the Asian leg of the season (episodes:4-6). I recognized Heather based on her super long hair and the bathing suit she was wearing, which matched the style of what she was wearing in that brief clip of her on the beach making that weird sound in the trailer we saw. Since Heather made it to F7, those shots couldn't have been on the Portugal/Spain final leg of the season. Anyway, those straw umbrellas are popular in different countries including Spain, but there are some variations on the style. I can't seem to find a way to identify where that part of the trailer was filmed, but if it's in Spain, then Tayshia may have reached F2, but I'm getting the feeling that Hannah G. probably snagged that spot. At any rate, if Tayshia was F3, that would mean she was eliminated back on Nov. 11th?, that's 14 days ago and I'm getting even more curious about why she hasn't appeared on SM yet. My imagination is running wild with each passing day. I’ve been told that it’s possibly a production tactic as to why Tayshia and Hannah haven’t come back to SM yet. Not sure how true that is but it’s definitely possible. I’m thinking that if Hannah was maybe F2 that her breakup was very hard and that is why she isn’t on SM. Not sure about tayshia though. Don't know that you can assume the reason why Hannah G hasn't come back is b/c she's so heartbroken, all f2 break ups are considered hard and while there are some that are harder than others they always come back to social media. Also Hannah is a social media influencer, her job relies on increasing her followers and reach, it doesn't make sense that she would let something personal like "heartbreak" effect her professional job as an influencer, my thought process is if she wouldn't take days off in a regular 9 to 5 for being broken-hearted, imo why would Hannah do it as an influencer who more than likely has an agent (as she models) who would tell her having a big following would help in her getting opportunities with modeling and music videos etc. I do think it'd be a bit cruel for production to be the reason why Hannah is not posting considering her lack of activity effects her followers which effect her sponsors, her opportunities and her money. Maybe the shocking thing that RS is talking about is that this is the first time both f3 or f2 girls seemingly have no problem keeping off of social media (or at least not toggling around with their accounts so obviously) than the f1 does. Wait, are we sure that Cassie is F1? When did that happen? It has not been confirmed that Cassie is f1, some are under the assumption that she is f1 based on the fact that RS called her a frontrunner and also said he would be shocked if she didn't win. Then there is the fact Cassie's sister followed Colton after HTD, and then Cassie's mother and aunt started following Colton after filming was done and around the time Cassie came back on social media, so some think that gives weight to Cassie being f1. And if I'm not mistaken, Cassie's mom and aunt have stopped following Colton on Saturday which made some feel like they lurk and are not trying to make it obvious who Colton chose. In any case nothing has been confirmed or spoiled that point to Cassie being f1 and not just one of the frontrunners of the season. @yana_bach wrote: Wait, are we sure that Cassie is F1? When did that happen? At this point we may not need any confirmation from RS, it's pretty obvious that she's F1. The only question is about who's F2/F3, and to be honest we can all guess that as well. This is going to be a very anti-climactic season unfortunately. 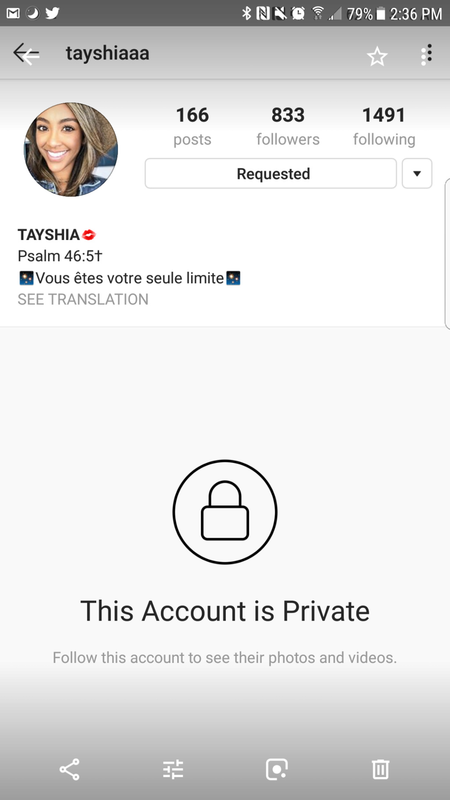 Slight movement on Tayshia's IG today, her posts went down by one for the first time, and her followers/following also went down by one. It started to look like she was in the beginning stages of a clean up, but nothing has changed since earlier this morning. I can see why given that both Tayshia and Hannah G. were supposedly eliminated almost at the same time, that TPTB may have instructed them to lay low. It would have been pretty obvious to those who are paying attention that something happened if they both jumped back on SM at around the same time. That's if they were both inclined to do so, especially given how things have allegedly ended. Of course when the FRC was supposedly happening a bit earlier than usual, many of us started to believe that someone may have been eliminated earlier than planned, which may have forced the FRC up a few days. Two weeks later, it's interesting that they've both decided to remain silent at least publicly, even though RS said they were active privately on SM. I'm still curious about how things played out and how these two women are feeling about the whole thing. A part of me says they were not surprised that he picked the person he picked, but may have been taken aback by the process.